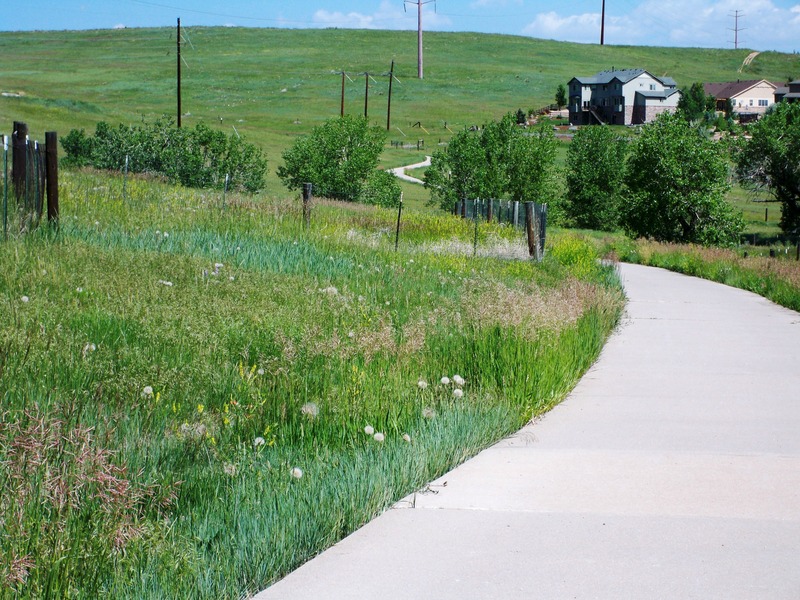 Bike rides in Colorado entail switchbacks, shortness of breath and stark beauty. I took my camera in early June on one of our local trails to capture the spring blooms. 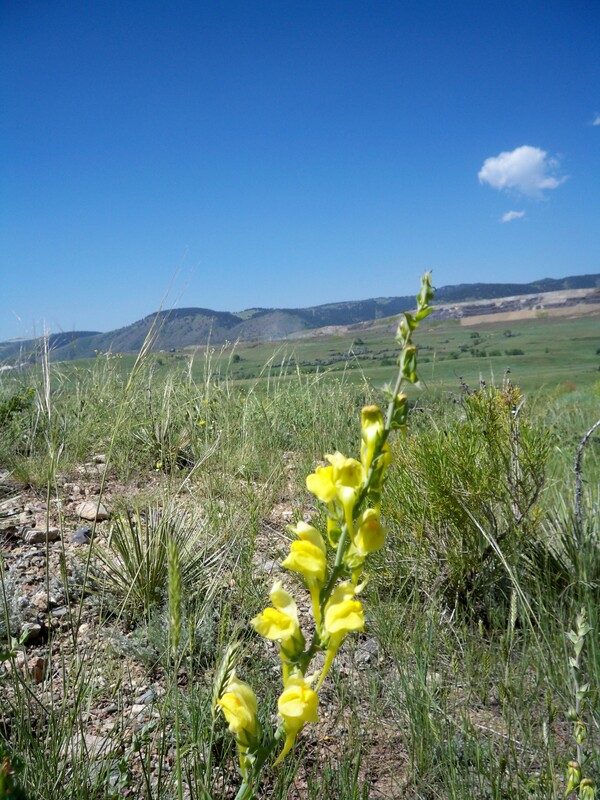 Later in the summer, we will take our bikes to the “high country”, the time when seasonal wildflowers color the mountainsides with their fleeting splendor. The short-lived green of a rainy spring belies the reality of our rocky, desert-like terrain. 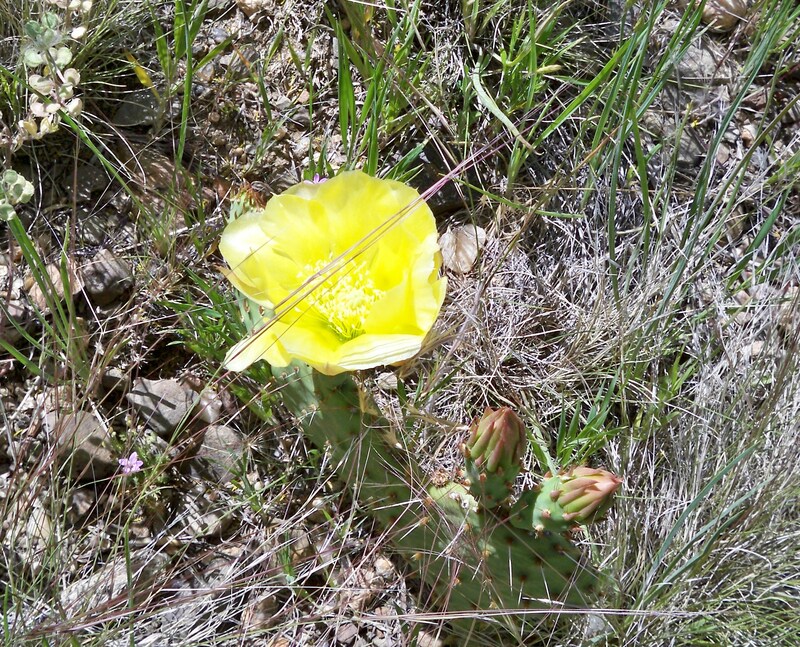 Our native plants are prickly and thorny and scrubby, selfish with their blooms and stingy with their beauty. 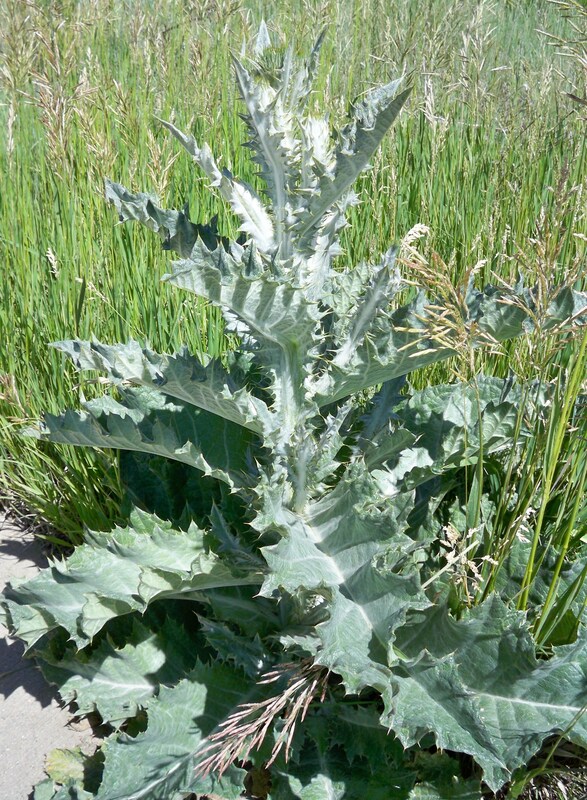 We marvel at their pluckiness and perseverance, and rue the invasive noxious weeds that are overtaking them. 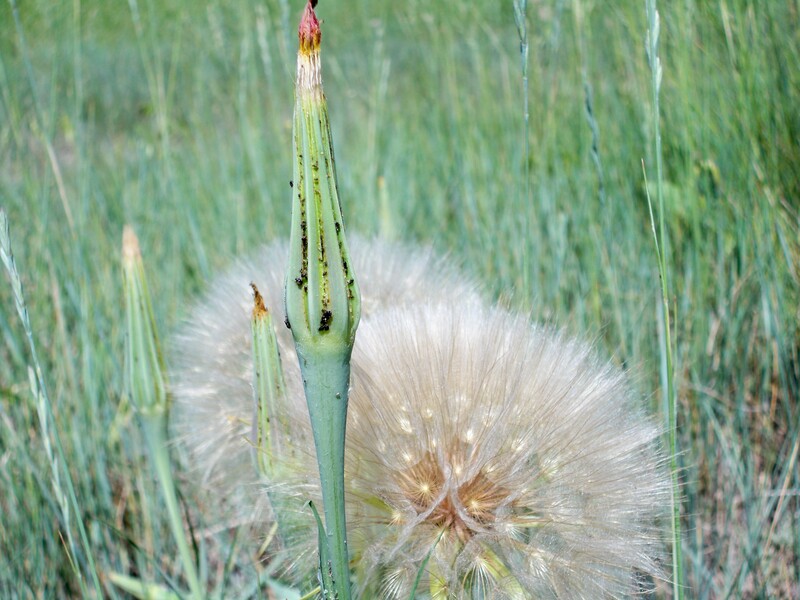 We grow our native weeds and their seed heads BIG here in The West! Thanks for stopping by and sharing your comments. I have heard plenty about kudzu, but don’t think I’ve seen it (perhaps in my home state of Michigan). Our noxious weed here is bindweed – such deceptively pretty little flowers while it’s vines are strangling everything. Alas, our pretty green is already browning as rains have ceased and hot winds blow. Spring is short-lived green but I do love summer. Haha, Thomas your giant dandelion of DOOM comment made me giggle. Thank you, Lainey, for your constant encouragement. I’m pretty happy in my little corner with God’s beautiful scenery. Some of our non-native weeds are real killers, but the native ones are quite pretty, I think. I love that first picture, I want to follow that path! Thanks! I’m glad the photo turned out so well. Fair warning, Jude, it gets steep and switch-backy after that far turn 🙂 but the effort is worth it for the views from atop the butte! Steep is a word I avoid! Ha ha – then I’ll just have to keep sharing my photos with you. Beautiful. 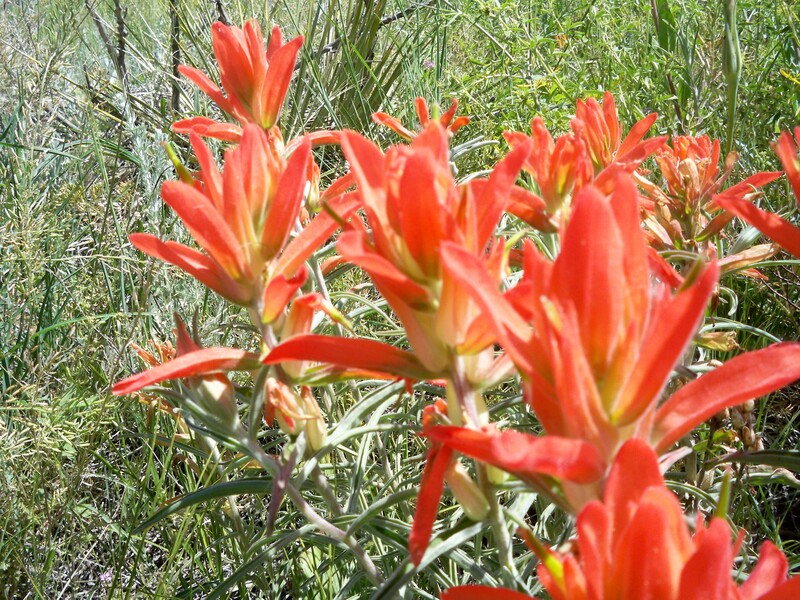 I had to chuckle over your “Indian Paintbrush” picture because in the Adirondacks, we had a flower, a weed really, but so pretty, that we called an Indian Paintbrush”, which looked nothing like this except that it was orange. So funny how common names mean different things in different locales. Enjoy your bike rides, and, please, continue to share pics. Thank you, Elizabeth. The pace of my bike rides slows considerably when I take my camera. I’m not even sure I can call them a work out! That is funny about the Indian Paintbrush. There were plenty of Native American tribes in the Adirondacks, but I think MY Indian Paintbrush is the real deal 🙂 It actually grows in a different color, depending on the altitude, which I find truly wondrous! Me thinks I recognize the huge monstrous thistle that also grows here. It is beautiful when it blooms and if it didn’t “bite” me every time I got near it, I might leave it alone, but it needs to stay out of my way in the garden. Beautiful high country. And all that bright sunshine and blue sky. We don’t see a lot of that here, but when we do I try to soak all the colors in. Hi Linda – I took a picture of the gorgeous purple thistle flowers on another “shrub” but it was too blurry to post. I came home with “prickly pokes” in my legs from tramping off the bike path for pictures and pulled several needles from my knee. These crotchetyy characters work in the wilds of open space but not your garden! All I need for heaven on earth is my sun and blue sky. I love the lush green of rainier, more humid climates, but I was born to live in Colorado in June! Marci! I was channeling you all weekend thinking about you enjoying Durango. I love Mesa a Verde but the word “sweltering” comes to mind when I think of my visits there. Ever since you told me you were headed to Durango, I realize it’s been years since we’ve been there or Telluride. I think Hub and I might head that way in August instead if the usual Copper-Vail area. Also this weekend I read Persepolis cover-to-cover and laughed, cried and shuddered. Marianne wrote such a simple, yet comprehensive, capsule of a centuries old, troubled culture. I loved the way she’s portrayed her parents, Uncle and Grandmother. It was a very touching, educational book. Then I looked at her interviews again. So glad you and I connected 🙂 hugs. PS can’t wait for trip photos and may-y-y-be a story or two from your family reunion?!? Wow, that’s one monster weed! Your beautiful photos make me want to go bike riding. I’ve got to get my bike out. Soon! Beautiful trail and photos! I went hiking last week in the mountains but we didn’t see too many flowers. It was a perfect day, though, not too hot, and I am grateful for the daily thunderstorms even though they grieve me when I am working! That weed is just enormous! But it actually looks pretty cool. More photos on your next bike ride please! Thanks for stopping by my blog. I too enjoy biking and photography. Thank you, Shelley, for stopping by! I am excited to read some of your previous posts about trips, and see Africa through your eyes! I plan to do some posting this winter about the trips we have taken.